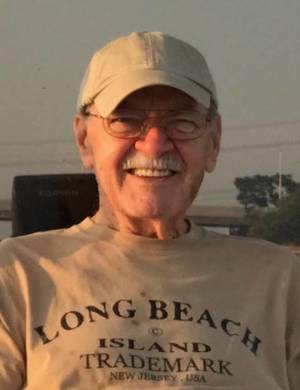 Robert J. Talmadge, age 80, of Manahawkin, NJ, passed away on Tuesday, April 2, 2019. Born in Mount Hope, NJ, he lived in Blairstown, NJ before moving to Manahawkin full-time where he resided since 1995. Prior to his retirement, Robert worked as a draftsman and manager for JCP&L, Morristown, NJ. He proudly served his country in the US Navy from 1957 to 1961. He was an avid golfer. He also enjoyed boating and clamming. He is predeceased by his parents, Richard and Anna (Hollis) Talmadge, and his two brothers, Richard and Harry Talmadge. Robert is survived by his loving wife, JoAnn (Salko) Talmadge, his son, Matt Talmadge, his daughters and sons-in-law, Barbara and Jack Lyons, and Mary Beth and Tim Newkirk, his two brothers, Hubert and Michael Talmadge, his sister, Rose Belding, and his seven grandchildren, Alexandra, Jonah, Amanda, Sean, Michael, Andrew and Ryan. He is also survived by many loving nieces and nephews. Visiting hours will be held on Friday, April 5, 2019 from 6pm to 9pm at Maxwell-Tobie Funeral Home, 573 Mill Creek Road, Manahawkin, NJ 08050. A Mass of Christian Burial will take place on Saturday, April 6, 12:30pm, at St. Mary of the Pines Church, 100 Bishop Way, Manahawkin. Interment will follow at St. Mary’s Cemetery, Beachview Ave., Manahawkin. In lieu of flowers, a donation may be made in his memory to The Gary Sinise Foundation, at www.garysinisefoundation.org, which serves our nation by honoring our defenders, veterans, first responders, their families and those in need.